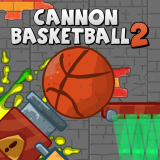 Cannon Basketball 2. Cannon Basketball 2 arrived, the new installment of the fun physics-based basketball shoot out game. Aim is to get the ball into the basket.